Over the years this blog has described the three tier system using an hour glass to illustrate how the beer industry operates. In this description the top part represents the breweries, while the bottom part represents the retail trade. The sand is the beer which must flow thru the middle part, aka the wholesalers, to ultimately reach the retail end. 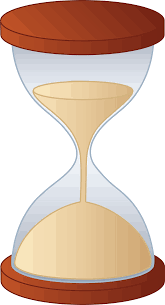 This hour glass model works well when describing how the industry operates to either those not involved in the industry, to students or to those new to the industry. An article recently published in Beer Business Daily highlighted how quickly the industry is changing. Historically, as the article stated, the beer industry was slow to change, however, the dramatic growth of crafts forced change. Until recently, the established industry believed that most of the newbies were somewhat oblivious to how and why the industry worked. To some degree, they were right. BBD’s article goes on to state that crafts have, or are becoming, educated on how the process works, and they now have a grasp on industry operation. The increased volume is causing the sand to flow over the top to the bottom, bye-passing the middle tier. More and more craft specific, small, boutique-focused wholesalers are getting into the business, some are even offering statewide distribution, and almost all are focusing on craft-only accounts. Also, the issue of direct sales from brewpubs, where legal, must be considered. In addition, more start up breweries are self-distributing. While this model works well for distributors, many of breweries are looking at the success of Stone and Windy City. They are interested in acquiring additional partners, whether they be crafts or imports, thus building critical volume and filling a necessary void for others. Similar to the course of Stone and Windy City, suddenly the brewery becomes a formable opponent in the market. As ABI continues their effort to buy distributors, closing one more option for craft breweries, it also creates additional opportunity for more sand to spill over the top or the hour glass. While crafts continue their march to 20% of the US overall market, expect a surge in craft/import small boutique distributors in major markets. The sand is flowing over the top. Resistance is futile! I don’t have a good work ethic, I have a real casual relationship with hours. My first day on a beer truck delivering Coors while a college student, was on a route that serviced a lake area outside of Dallas. Because all beer was DSD at that time, we took two trucks loaded with beer. The route salesman, a full time helper, and I were the only staff needed. We left the warehouse around 6:30 am and returned after 7 that night with two empty trucks. I was so tired I slept in my uniform, got up the next morning, and did it all over again. That day I was given a downtown route. The truck was loaded with returnable bottles and my job was to empty a pallet of bottles and re-stack it with empties. Not the same as the lake route, but equally as hard physically. We finished that Friday just before five pm. I was just as tired on this route as I was on the lake route. As the years went by, and the beer industry changed, what has never changed is the fact that the industry is not, a 40-hour a week job. It does not matter what tier we examine. All three require hours of work and a commitment unlike most other industries. It does not matter if you work at a brewery, in a distributorship or as an importer, these positions all require long hours, hard deadlines, and working many weekends and holidays. Recently, when visiting with the Director of Operations for a large and successful MC operation, he mentioned that his real issue was finding employees who were willing to work the long hours required. This same frustration was the number one issue that resulted from last summer’s survey of crafts, importers, brewers, importers and industry headhunters when asked for their input on the skill sets of employees. When running Warsteiner’s U.S. operation, the company needed to employ experienced individuals with multi-level skills. We did not have a budget for hiring young entry-level people. Diverse experience and a strong work ethic were the major keys we required when hiring. Many colleges today have programs to educate individuals in the beer/wine/spirits industry and have focused on instructors from all parts of the industry. Teaching and providing the needed skills for these students is very doable. What cannot be taught, however, is the commitment and work ethic the industry requires. The question becomes, will the industry change, or will the individual change to fit the historic industry profile? Do those retiring expect new employees to adapt to the previous work ethic, or should the industry change to adapt to the skills and work ethic of the incoming crop of employees? The beer industry is changing, and changing quickly due to the craft segment’s growth, but the dynamics of the industry are slow to adapt. The millennial will change this, too. I don’t have a work ethic, I have a real casual relationship with hours! Much has been, and will continue to be written about crafts and how their percent overall beer sales in the U.S. will land. The stated goal is for crafts to possess 20% market share by 2020. Stats show that sales have slowed for the on-premise accounts, but continue to grow for the off-premise accounts. The marketing for crafts seems to be shifting from the off- premise in building the brand from the on premise. Either way, the craft segment continues to dominate the industry in all areas. 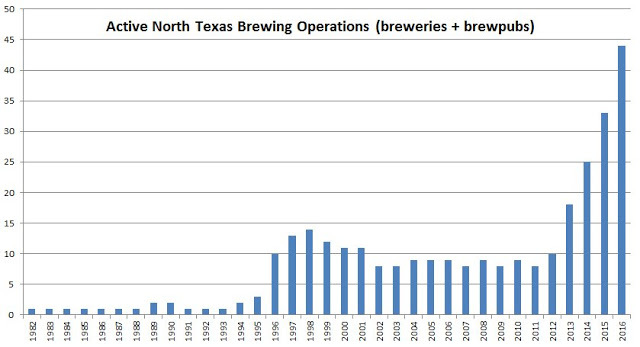 Perhaps nothing more readily demonstrates crafts’ growth than the attached chart for N. Texas. The current number of breweries and brewpubs, and those coming to this region, is similar to many other parts of the U.S. Consumers are driving this growth with their continued support of the segment, and entrepreneurs see a great opportunity to make some money. Politicians have also taken note of the industry growth because crafts help with job creation, taxes, and advertise the cities and states in which a beer is sold. For both the politicians and the crafts, this continued growth is a win-win situation. The question is, how does the industry support the craft growth with skilled individuals? 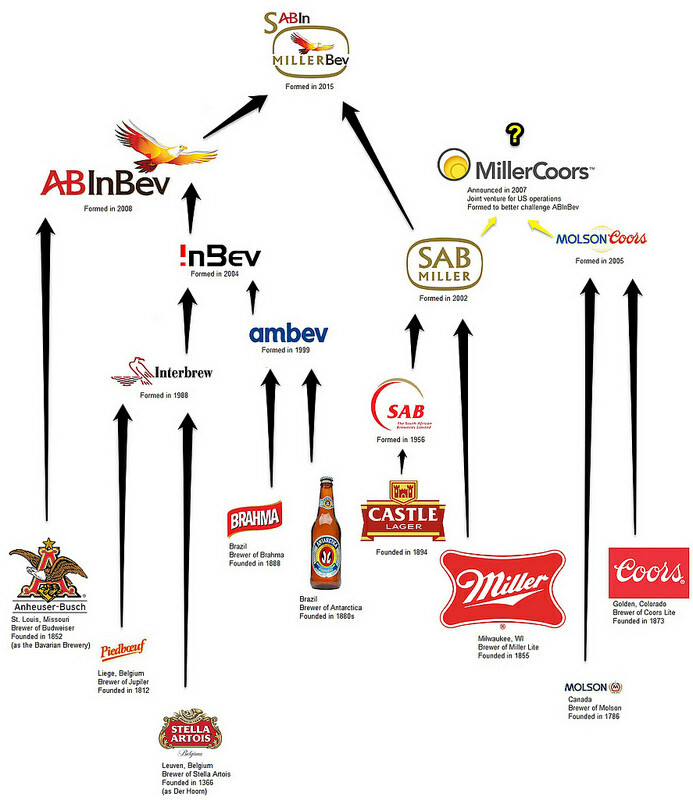 As in previous blogs, we looked at the crafts and how they acquired many ABI and SABMiller employees due to downsizing. But even that pool of talent is finite. So what happens next? For decades, there has been a small but highly effective number of schools who taught the brewing and technical side of the business. 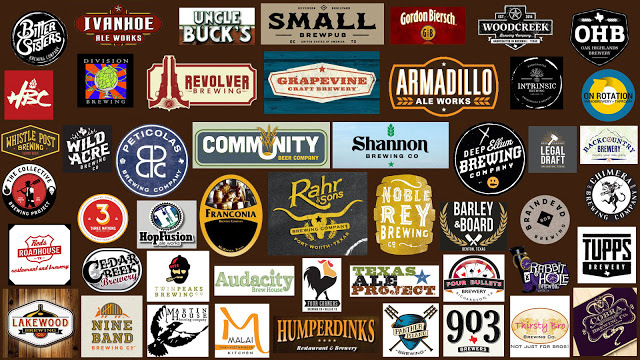 The Siebel Institute led in this field, but other establishments have been created institutes of beer education across the country, now including Dallas. Those teaching the brewing classes are led by highly trained, credentialed and experienced instructors. Students who complete these programs are well qualified to work in brewing. As a natural extension to this technical side, many schools have developed classes for the business side of beer. Class topics include, but are not limited to, sales, marketing, chains, budgeting, planning, merchandising, pricing, and other key components of the industry on all three tiers. While at first glance, it would seem that schools would have a large pool of experienced industry executives from which to recruit. In certain areas, including legal contracts or accounting, there are a number of highly qualified professionals who specialize in crafts from which to recruit. Such talented individuals can, and do, provide great insight. What schools, students and companies need to watch for is that there are now some self-proclaimed experts who have become involved in attempting to educate people in beer. Some have written books delineating how to become successful in crafts or teach subjects on crafts. Frequently, such individuals have no, or limited, skills/experience in crafts or in the beer industry as a whole. There is no doubt that the industry needs schools to help educate a workforce. This was evident last summer as almost 30 breweries, wholesalers, importers, and crafts responded with their lists of needed skills for potential employees. It was eye opening! In a future blog these desired skills will be outlined. Schools and potential employers, however, should take whatever time necessary to ensure potential workforces have the right skills from the best teachers. It is not the teaching, it’s the learning. This post begins my fifth year of blogs. As a follower, you know that I have been around the beer industry for a long time. During these many decades I have seen a myriad of changes, some went well, others not so well. For years, MBA classes have taught students that a key ingredient to success is learning how to manage change. That said, one might think that being in the beer industry as of late, would put that philosophy to the test. Change seems to be the norm. Looking back on all the changes during my years in the industry, without exception, when one company acquired another, the statements: “business as usual” or “we anticipate no changes” where often made. Sound familiar? The only time that I remember the above statement NOT being made was when Philip Morris bought Miller Brewing. Most of the changes from acquisitions created damaging results, e.g. Stroh Brewing’s purchase of Schlitz Brewing; Alan Bond’s purchase of G. Heileman; Paul Kalmaitz procurement of Pabst and others. These are just a few examples of purchases that did not have favorable results. Outside of Philip Morris’s buying Miller Brewing, another acquisition that did work well was when Barton Beers (now Constellation) got Modelo from Gambrinus. Gambrinus, however, was able to buy and save Shiner, which is now a major craft. This brings us to 2016, where a number of beer companies have been purchased or participated in a JV with another companies. Many established and successful crafts sold all, or part, of their companies. Only time will tell if these will work. Distributors seem to be more successful at making these buy-outs work. Consider Reyes buying Windy City, which as to date, has been a great success for both companies. Glazer’s, too, continues its purchase of other operations with successful results. This year will provide the largest acquisition that the beer industry yet seen, when ABI and SABMiller are consolidate. Much has been written about this union and will most likely continue to be a hot topic of discussion. Recent hearings in Washington concerning this transaction focused on the perceived control that ABI will have in the US. When questioned about this deal, Carlos Brito of ABI stated over and over that there will be no changes in the US for ABI. Another “business as usual” statement. Looking at this deal from afar, what you see is that Brito is correct. By selling the Miller brands to MolsonCoors, market share will remain the same for both companies. If that is true, then what is the big deal all about? It is not about owning Miller, or the access to market for crafts and imports, or even owning brewpubs. It is about the “business as usual” statement which should be more concerning to everyone. Just this past December, ABI bought three craft breweries and their brewpubs. Two are located in the US. Once ABI closes on SABMiller, expect ABI to accelerate this model with more crafts to buy, more distributors to buy, more brewpubs to buy and run, more and more of the same. ABI wants to control as much of the three-tier US market as they can, and with the SABMiller deal, it makes it easier for them to do so. Regardless of what Brito or anyone else states, its business as usual, tell the truth, it’s easier to memorize….